← Join us for an emergency communication field exercise on June 11th! Stop by our booth at the Morgan Junction Community Festival! 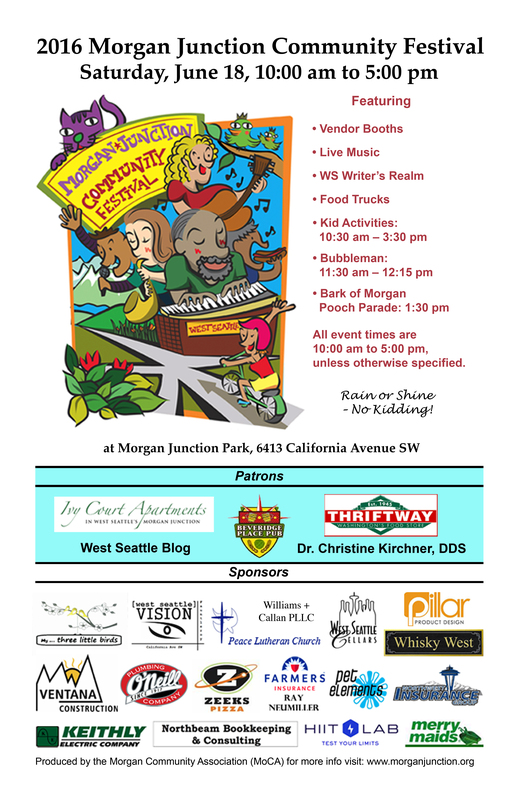 West Seattle Be Prepared will have an informational booth at this wonderful neighborhood event! It’s this coming Saturday, June 18th. Please stop by! It’s a great opportunity to learn more about the West Seattle Emergency Communication Hubs. We now have 13 local hubs; you can pick up our newest hub map postcards that show additions and changes. As well, we’ll have other preparedness materials including information about how to prepare for those who depend on you (such as pets, kids, and those with special needs). Look for us in the vendor area, which is just north of Morgan Junction Park (at 6413 California Ave SW). We’ll be there starting at 10 AM. The festival runs until 5 PM. We hope to see you there! Here’s a preview of the festival, along with this year’s poster! This entry was posted in Announcements, Events and tagged disaster preparedness, earthquake preparedness, emergency communication hub map, Morgan Junction Community Festival, West Seattle Emergency Communication Hubs, West Seattle emergency preparedness. Bookmark the permalink.